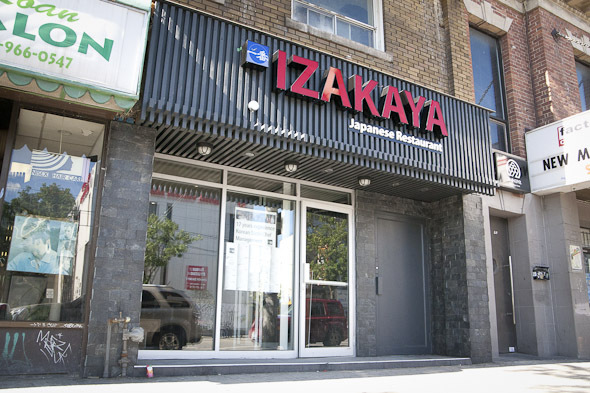 Izakaya, which opened two months ago, offers traditional sushi a la carte as well as an all-you-can-eat menu. The shiny new sushi joint located near College and Spadina glows like a jewel among the more run-down computer shops and bodegas, leading me to wonder if it might have more success in the Annex . On a Monday night, Izakaya is pretty much empty. Save for the table of eight frat-boys paying their bill as my friend and I sit down, we have the restaurant to ourselves for the first half-hour of our meal. The wooden paneling and the slate floor create a cozy atmosphere that done with less earthy materials might feel cafeteria-like. A small glass fridge in the middle of the restaurant reveals the cuts of fish being used that day - a good sign that we can expect fresh fruit de mer. Izakaya also has a "party" room in the back that can be rented for private funcations and comes with free karaoke. Having arrived very hungry, we both agree the all-you-can-eat menu will be the best way to satiate our greedy taste buds ($14.95 dinner/ $12.95 lunch). Our server provides us with a piece of paper to write down our choices, and we begin the first wave of our Japanese buffet with a mix of appetizers, nigiri and sushi. The green dragon roll, which arrives first, is a mix of cucumber, avocado and yam with teriyaki drizzle. The rice is cooked properly and the veggies inside are pretty much what we expect from an all-you-can-eat meal - average. Not too ripe, not too flavorful, but not terrible. The dynamite roll on the other hand is quite good - the brittle tempura shrimp is still hot when it hits the table. The veggie gyozas that come out next are made up of what appears to be just potato and peas, resulting in a mushy, dough-like center. The wakame salad is tasty though - the seaweed is nice and tough and avoids the salty pitfalls of most wakame. The white tuna nigiri we try isn't melt-in-your-mouth, but a surefire way to tell if the fish is fresh - and it is. The tuna leaves the light, buttery aftertaste on my tongue that I'm hoping for and proves the fish case isn't just for show. Having finished the first round, we go for tofu teriyaki, shrimp and veggie tempura and a green salad next. By this point we're on our way to being well-stuffed. The tofu teriyaki and shrimp tempura are everything one would hope for, crispy and piping hot. The only downside to the shrimp tempura is the sauce served on the side, which is virtually devoid of flavour. I try dipping it in a mixture of sriracha and soy sauce and I'm happy as a clam. Izakaya isn't the best Japanese in town, but it's fresh, affordable and the service is very friendly and accommodating. Their regular menu is very decently priced too - with 14 different bento box "specials" running all day, ranging from the Bulgogi box ($6.95) to the barely pricier 14 piece sushi box combo ($9.95). All boxes come with soup, salad and rice. If you're looking for a brew or sake with your meal however, hold off for another week - that's when they'll be getting their liquor license.